Yossi Vardi has made my time here in Davos simply incredible. I am in deeply in his debt for what he’s personally done for me. The Shabbat dinner he took me to last night was simply incredible. I filmed an intimate traditional ceremony there. It is the one video I’m keeping for myself and I will treasure those moments more than my walk with Mark Zuckerberg. How special was that? Well, Klaus Schwab, the Founder and Executive Chairman of the World Economic Forum, told me that it is his favorite event of the whole week. You can’t get in without a private invite and it was one of those things that you just can’t believe you’re part of. I was pinching myself to make sure I wasn’t dreaming. Who is Yossi? You can read about him here but that really doesn’t do it justice. 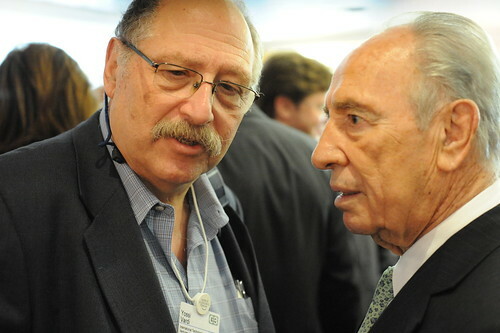 He has the ear of the Israeli president and is very influential in Davos. If you ever get a chance to go to Davos and Yossi wants you to go somewhere you go. Yesterday I had paid about $80 for a lunch and he walked up and told me “you aren’t going to go to that.” He then said “follow me” where he brought me to a lunch where there I got a lot of the photos on my Flickr stream. When Queen Rania of Jordan walks into lunch (she’s talking to the head of Columbia University in this photo) you KNOW you are in an interesting lunch. Thank you Yossi for your friendship and mentorship. It’s not many people who’ve had such a deep impact on the future of my life as you’ve had. Thank you. Thank you. Thank you. Yossi has been a friend of mine for 12 years now. We met after I started one of the first Web sites to support and evangelize ICQ (his kids started that, which they sold for $407 million to AOL after 18 months in business). Everytime he meets me he greets me with a good joke, a big hug, and a warm personality. He treats everyone the same, by the way, from world leaders to everyday people he meets. He’s really an incredible person and someone I feel very blessed in knowing. UPDATE: I just filmed Yossi Vardi who talked about this morning’s breakfast he hosted. I’m attending a concert tonight, then going skiing tomorrow. On Monday I’m traveling. So, probably won’t see you for 48 hours. Which is just fine cause I put up 48 videos from the World Economic Forum you can watch. UPDATE: Thanks Shel for pointing out that my photo stream on Flickr is quite active. I have a bunch of photos I’ll have to wait to upload. My photo stream is here. More to come when I get home on Monday night. It’s interesting to hear different people’s opinions at the World Economic Forum about what the economy is going to do this year. Most people here believe we’re in the midst of a recession, which technically is two quarters of negative growth. There’s certainly many here who are gloomy about the future, but there is definitely lots of positivity too. I spoke with Steve Forbes last night (yes, that Steve Forbes) and he thinks that the doom and gloomers shouldn’t be listened to. He sees one quarter of bad news and then sees the economy coming back in the second quarter. I forget his name, but a senior partner at Accel Venture Partners told me while we were waiting for a bus together that he’s watching the sales and other data from 250 startups reporting to Accel and he sees nothing but growth and is very optimistic. That optimism has been shared among the VC’s I’ve run into this week. Google execs are upbeat and are hiring and so are many other companies. Startups continue getting funded. Facebook’s executives tell me they are continuing to hire and expand at a rapid pace. On the other hand, the subprime problems are very real. I know a couple of people who are getting kicked out of their homes because they couldn’t afford to keep up with payments. Now, you can blame these people, but one of these families has an autistic child and so the mom can’t work. That wasn’t something they planned on, but they are getting evicted nonetheless and this is in Silicon Valley in Saratoga, a pretty rich community. Certainly real estate values are under pressure, in some communities in San Joaguin Valley in California housing prices are seeing huge drops (I’ve heard stories of homes being sold for $350,000 in neighborhoods where prices were $600,000 two years ago). So, are we in a recession? Or are things going to roar ahead in 2008? What are you seeing from your vantage point?